It’s me the dog, Chess, again, of course. You may remember me from all the posts I did last week, all of which were totally excellent. We border collies are generally totally excellent. Here I am in another characteristic pose. Trying to avoid having my picture taken. They say if you look away, they can’t take your picture. Before I get to the big news of the day, the guy I live with said to show the bunny picture. 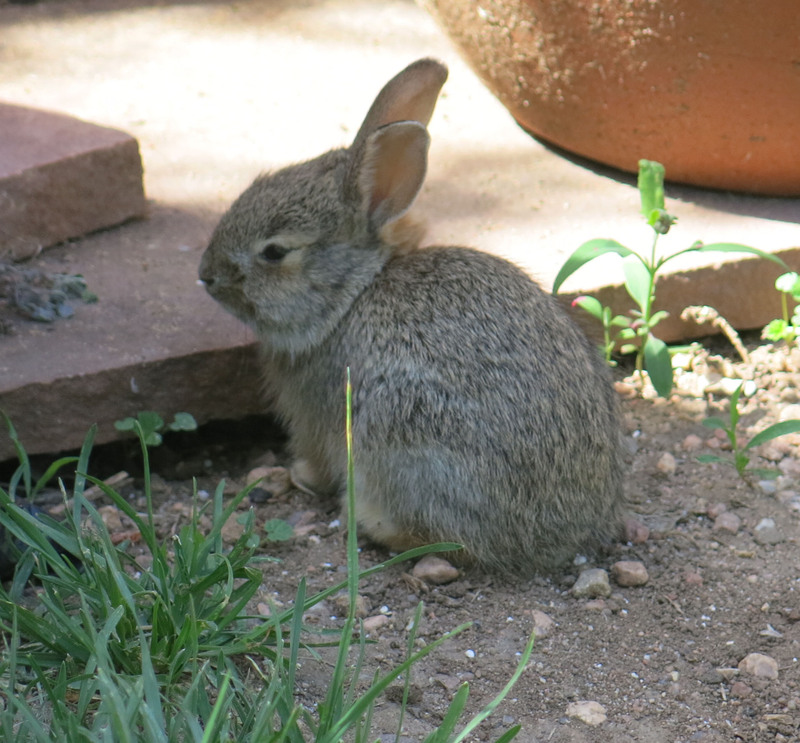 The guy I live with is a complete sap, and thinks baby bunnies are cute. He gets mad at them when they grow up, but he doesn’t do much of anything to stop them, except spray weird-smelling things like Bunny Be-Gone. He says the sprays sort of work. Anyway, this little bunny can’t have been out in the garden for very long at all. It’s so little, it’s little. Almost as cute as me when I was little. It looked really sleepy and the guy I live with was going to pick it up but it got scared, so he left it alone. That’s pea gravel on the ground, to give you some sense of how little this creature is. Now to the news. A while back, the guy I live with posted pictures on how to move a trough, and at the very end he broke the trough. Which is typical, I might add. 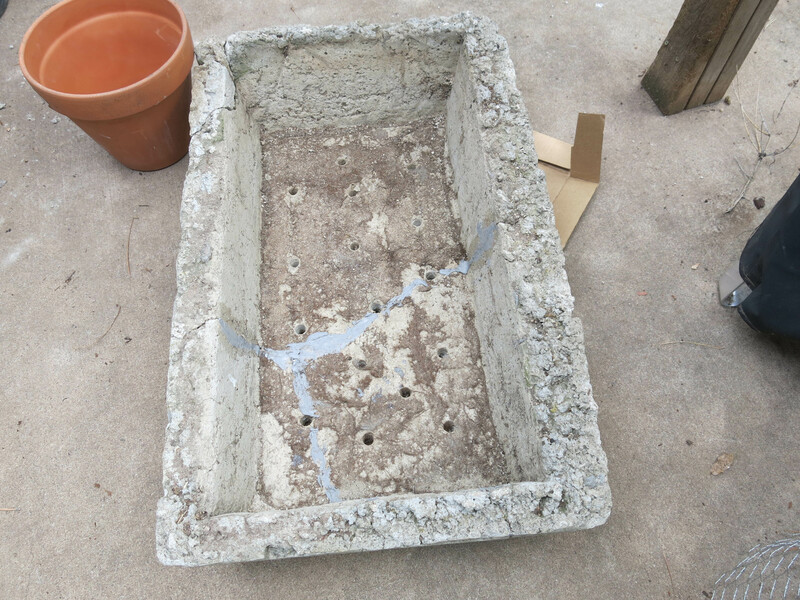 Then the two smaller pieces were fitted together, just to check the fit, and painted with Quikrete Concrete Bonding Adhesive, stuck back together, and left to dry for a day. Then the two halves were fitted together and glued. After that, the cracks were filled with Concrete Crack Seal. You can see it in the bottom of the trough, where he didn’t neaten it up, as they say. The corner that broke off long before I was born has been glued back, and the flower-pot is holding it in place. The guy I live with says flower-pots are good for holding things in place. In a couple of days he says he’s going to pick it up and set it on cinder blocks. He has done this before, more than once, because he breaks troughs more than he would like to admit. And the cinder blocks add class, don’t you think? The troughs are kind of the equivalent of trailers, in a way. Well, if he picks it up, and it falls to pieces the way I think it might, then I’ll tell that story, too. This entry was posted in Uncategorized and tagged hypertufa. Bookmark the permalink. Wow Chess, he really fixed it! You have to take back all those mean things you said about him now. I appreciated seeing his process. You take pretty good pictures for not having opposable thumbs! P.S. The baby bunny is extremely sweet! Very. Hard to be angry at something that cute.